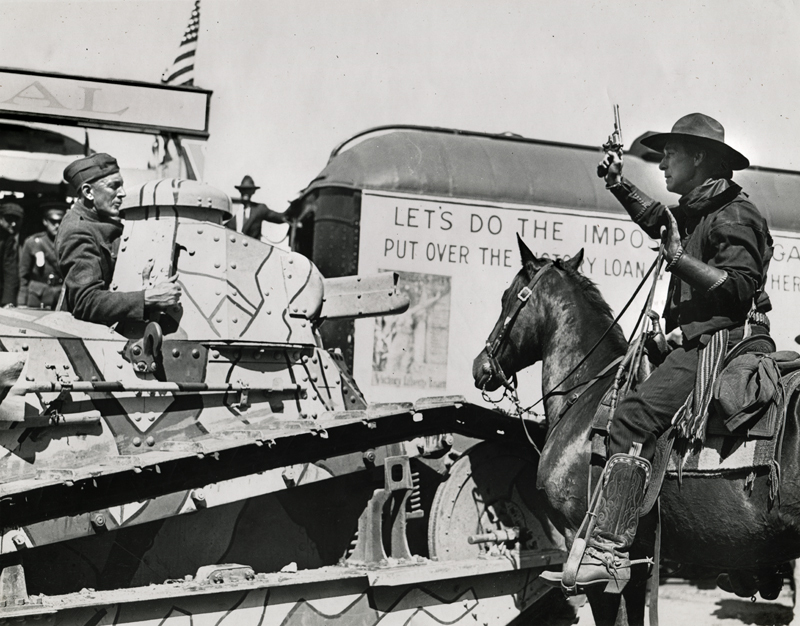 April 16, 1919 — Actor William S. Hart stages a mock holdup of the Liberty Loan train in San Fernando, Calif., as a publicity stunt to promote the 5th Liberty Loan bond series. Apparently a tank drives up to save the day — and sell Bill a bond. An unknown person's handwriting on the back of this 8x10 glossy publicity photograph reads: "San Fernando, Cal., April 16, 1919 / Taken during the holding up of the 5th Liberty Loan train by Wm. S. Hart and Co. / The Whippet tank selling Bill a liberty bond." The fifth and final bond series of World War 1 was issued April 21, 1919, five days after this photo was shot — and five months after the war ended. Thus the 5th series was known as the Victory Liberty Loan. The issue consisted of $4.5 billion in tax-exempt bonds earning 4.75 percent interest, with principal and interest payable in gold. LW2414: 9600 dpi jpeg from original print purchased by Leon Worden.